Back when I was in college, we didn’t have laptops. I didn’t even have a mini cassette recorder to tape the lectures. No sir, I had to take notes with a pen and paper! (And I had to walk to class uphill, both ways in 10 feet of snow in my bare feet!) Nowadays, most people use laptops or smaller digital audio recorders to take notes at lectures and speeches. But what about us relics who still prefer using pen and paper? (you can’t doodle in the margins on a laptop!) We laboriously take great notes, that later we have to transcribe into our computer for future use. Is there an easier way? 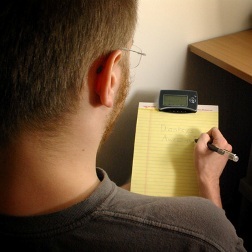 Mobile NoteTaker operates in two modes, Mobile or Connected. In Mobile Mode the device enables the user to capture and store the notes / sketches digitally at meetings, lectures or conferences. Connected Mode synchronizes the Mobile NoteTaker and a PC / Notebook via USB cable. The user can upload, organize, move, edit or add to handwritten notes ideas, sketches, phone numbers or reminders. The included software also enables memos, notes, and sketches to be sent via e-mail or over the LAN network. It is also possible to write directly into Microsoft Word or Outlook, and add a personal touch to ICQ instant messages. Better yet, you can use any type of paper (up to A4 size): envelope, receipt – heck I bet you could even use a napkin. Everyone knows the best ideas are sketched out on a napkin. Pick one up for $169.99 and keep using that notepad!